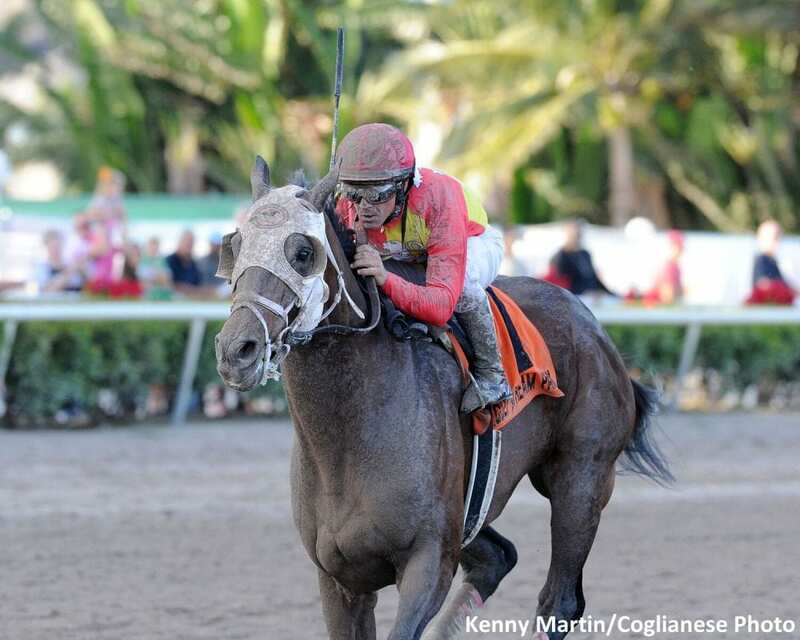 The victory of Fear the Cowboy (by Cowboy Cal) in the Dec. 16 Harlan's Holiday Stakes at Gulfstream Park poked holes in the aspirations of some horses looking at next month's $12 million Pegasus World Cup. But the 5-year-old's victory brought cheers from fans and partisans as far apart as Kentucky and South Korea. Fear the Cowboy was bred in Kentucky by the University of Kentucky, raised at UK's Maine Chance Farm on Newtown Pike north of Lexington, and then sold at Fasig-Tipton's Kentucky winter mixed sale across the road from Maine Chance in February 2013 when Fear the Cowboy was a short yearling. The leggy bay didn't bring much, selling for $1,500 to Alexandro Centofanti. Those skills are an important part of UK's contribution to educating these young people, Lawrence said, because “few of the students come from a Thoroughbred background, and it's a good introduction to Thoroughbreds.” The Maine Chance operation raises 15-20 yearlings annually and sells them at Fasig-Tipton “because it's right across the road, and the shorter sales fit into the students' schedules more easily,” Lawrence said. The education for and introduction of young people to the Thoroughbred business is one reason the farms and owners in the region support UK, its Maine Chance Farm, and the overall equine program so enthusiastically. In the case of the Harlan's Holiday winner, both the dam and the season to the sire were donated to the program. Lawrence said, “Jeffrey Morris at Highclere Farm donated Whom Shall I Fear,” an unraced daughter of the Dehere stallion Soto, who stood at Highclere. Morris said, “One of the motivations for donating the filly was Ned Morrison, a really nice guy who got interested in Soto and bought into that filly, but we ended up not getting her to the starting gate. The mare was a maiden, and I donated her near the end of 2009, when she was an unraced 3-year-old. Morris, however, had bred a foal out of the Pulpit mare Leh She Run in 2009 that turned out to be O'Prado Again (El Prado), winner of the 2011 Remsen Stakes and a $350,000 Keeneland September yearling in 2010. That made Whom Shall I Fear a nicer-looking prospect for UK when considering her next mating, and Lawrence said “the big success of First Samurai (two-time G1 winning juvenile by Giant's Causeway) in the mare's second dam led us to look for a Giant's Causeway stallion, and Pin Oak was generous enough to donate a season to Cowboy Cal,” a young son of Giant's Causeway who was fairly popular at the time. In the interim, Cowboy Cal was sold to stand in South Korea and Fear the Cowboy dawdled his way through the Fasig-Tipton sale. That was, however, the last time the bay colt was caught dawdling. Repaying sensible management, the competitive bay has been on a consistent upward trajectory throughout his career. Fear the Cowboy won a maiden at 2, then became a stakes winner at 3, repeated with a stakes victory at 4, and has won a pair of Grade 3 events this season at 5, with total earnings of $570,869. That's a hefty return on a $1,500 horse the students, staff, and management at UK and Maine Chance have many reasons to be proud of. As Lawrence said, “A lot of our horses have gone to end users,” like the owners of Fear the Cowboy, and that has the advantage of benefitting both the buyers and the young men and women who are learning the ropes in an uncertain game. Frank Mitchell is author of Racehorse Breeding Theories, as well as the book Great Breeders and Their Methods: The Hancocks. In addition to writing the column “Sires and Dams” in Daily Racing Form for nearly 15 years, he has contributed articles to Thoroughbred Daily News, Thoroughbred Times, Thoroughbred Record, International Thoroughbred, and other major publications. In addition, Frank is chief of biomechanics for DataTrack International and is a hands-on caretaker of his own broodmares and foals in Central Kentucky. Check out Frank's lively Bloodstock in the Bluegrass blog. This entry was posted in Bloodlines, Bloodstock, NL Article and tagged Bloodlines, fear the cowboy, Frank Mitchell, harlan's holiday stakes, Maine Chance, maine chance farm, Thoroughbred breeding, thoroughbred pedigrees, university of kentucky by Frank Mitchell. Bookmark the permalink.